Ionity picks us up at Oslo Central Station in a small fleet of four Audi e-tron. It is an early start because the latest high power charging in Norway is in Ringdalskogen, about 1.5-hour drive south-west from Oslo. The location is one of Ionity’s most abundant and will later appear as quite the hotbed for charging applications. However, first, we take the opportunity to chat with the director of Audi Norway, Elin Sinervo, who is taking us for the ride in Audi’s new electric spacecraft. While we overtake the fossil-fuelled traffic on the expressway and use the empty bus lane – a privilege electric cars still enjoy in Oslo provided the EV has at least two occupants – the director reports that they could hardly wait for the first real EV from Audi to arrive finally. It is impossible to do business in Norway without an electric model on offer. In March alone, 77 per cent of all buyers opted for a new electric car in Oslo. Nationwide the EV share of new sales stands at over 50% a- numbers even Christina Bu of the Norwegian EV association considers “records”. Tesla has the lead, and symbolic home advantage – the Model 3 is Norway’s new Volkswagen reportedly. It is a question of price though, says the Audi boss, and the advantage of the now established first mover. Nevertheless, the 65,000 euro e-tron is selling. Of 7,200 reservations, the dealers converted 4,400 to contracts and delivered about 800 e-tron, says Sinervo. The German Audi headquarters recently spoke of 672, but in any case, there is potential. The director assumes that under ideal delivery conditions they could generate about 75% of their sales with the E-Audi – that is up to 12,000 EVs in a year. These numbers make a business case for infrastructure providers too and at this point, both Bu, as well as Ionity COO Markus Groll, take the Norwegian market as a matter of catching up with demand. So the HPC provider has been keeping busy. When we arrive at the Ringdalskogen location, it is apparent that it is open and in full swing. Besides our Audi e-trons, real consumers form a steady backdrop to the event. The “opening” quickly turns into a get-together for both the press and the partners, who have come out with 30 people at least. Ionity is a multi-partner business both in its foundation and its inner workings. Planning and permits are one piece of the puzzle, working with grid providers for connections and location owners for leases another. 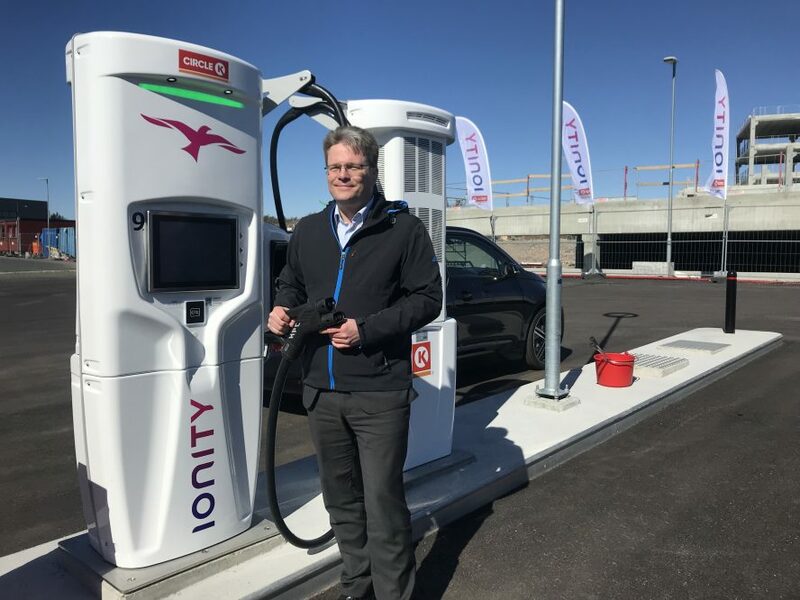 In Norway, Ionity works exclusively with Circle K and the Canadian-owned service station operator is determined to benefit from the transformation the oil-producing nation is undergoing. 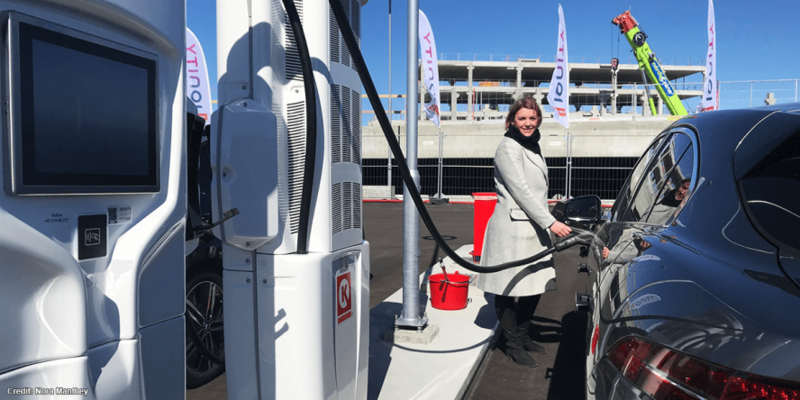 The Norwegian vice president of the company describes the situation as a “perfect storm” and points to the group’s ambitious goals: Circle K plans to equip one-third of the “energy stops”, as they now call the filling stations, with charging stations in Norway. In 2020, 100 locations are to accommodate around 500 charging points. These include Ionity but not only. Circle K wants to enter the business itself, and a new app and home-charging suite are imminent. Nevertheless, the Ionity COO Markus Groll says that the locations for the network on Circle K stops stand, and Ionity is not alone in Norway in any case. 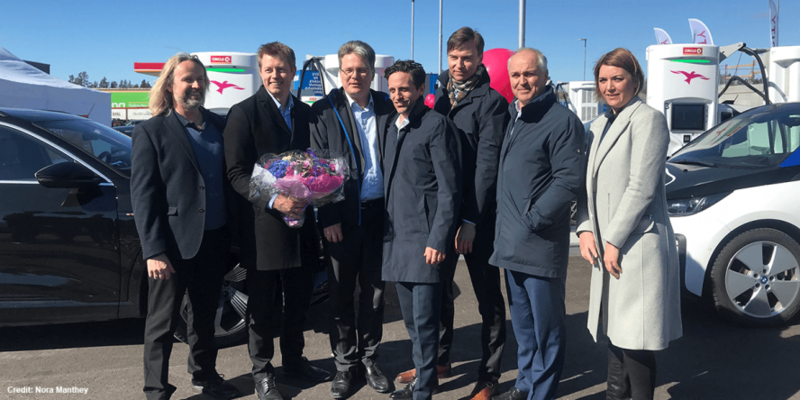 Fortum, for example, is also looking into high power charging the Nordics and when we inquired about competition, Groll stressed Ionity’s all-European focus. Also in Ringdalskogen there are further charging stations on the large site, a Tesla Supercharger Park is directly opposite. However, this does not stop Norway’s Youtube Vlogger Björn Nyland from charging his Tesla with a steady 120 kW at one of the Ionity stations. Charge power, he says, he is currently not getting at all Superchargers. The Audi e-tron drags faster still and makes it to the 150 kW once. The rest of the time the charging power varies between 118 and 132 kW and the station vibrates slightly. It is the pump that cools the new thick cables with liquid (our background story is here). 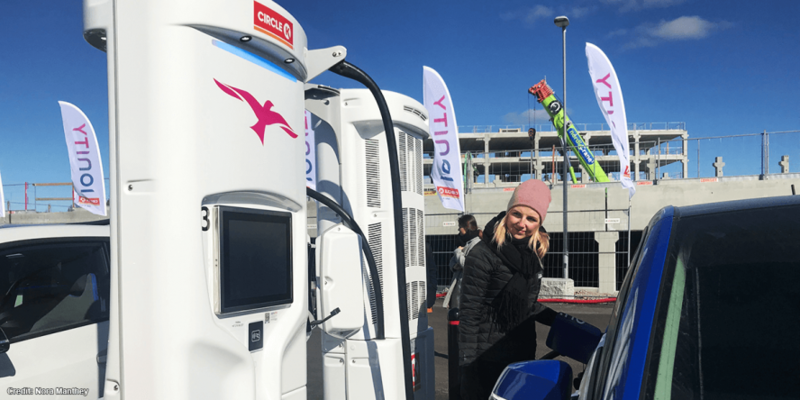 At Ringdalskogen Ionity has eight 350kW CCS charging points with a 2,5MVA grid connection and is ready to upgrade to twelve. Groll also reveals some data about the current user behaviour. The Hyundai Kona Electric is a frequent visitor at the 74 Ionity sites currently open. The Korean EV came to market early and charges with 75 kW. In the two hours spent at Ringdalskogen we counted two, and just as many Jaguar I -Pace. In this area of Norway, there are many summer houses of well-to-do Osloers. 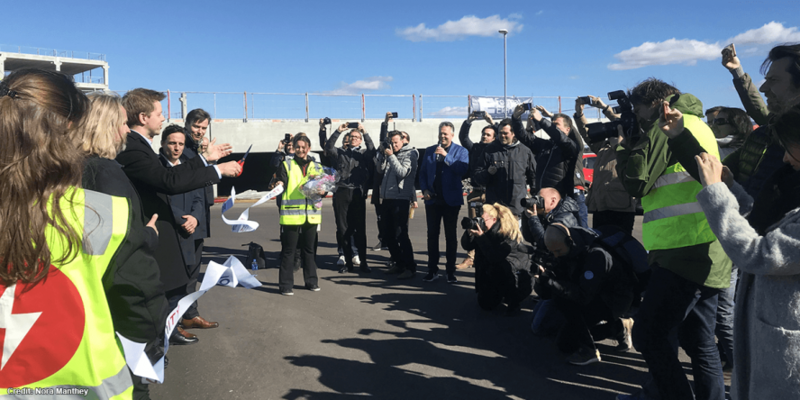 But Ionity has set-up shop here because Ringdalskogen is one of six stops along a corridor that will soon connect Oslo and Bergen via Stavanger. The high power halts stand at a distance of 120 – 150 kilometres and form one of a few charging passages under simultaneous construction. Ionity is working at three more locations in Sweden and five in Denmark. The “Hurtigladers” in Stockholm and Malmö are at an advanced stage so that the journey over the Öresund Bridge will soon lead straight on to continental Europe. Nevertheless, it took Ionity time to become visible in this part of Europe. COO Groll explains that building permits of all kinds are the biggest hurdle to the roll-out of the targeted 400 high power charging locations in 2020. Given the timeline, Groll points out that the network is building “twice as fast as Tesla when it comes to ramp-up,” considering Ionity started working in earnest in 2017. Construction is currently underway at 49 sites and in three regions and 95% of locations secured. Much depends on regulations, and regional manager Jan reports that rules differ even across the Nordics. “In Sweden, you can set up a charging station and receive permission to sell electricity later. In Norway, the process is easy enough, but you have to stop during winter,” he explains, and Groll also blames the frozen ground for the delay. In other countries though, works have been quick, and the COO counts Austria among the most developed markets. 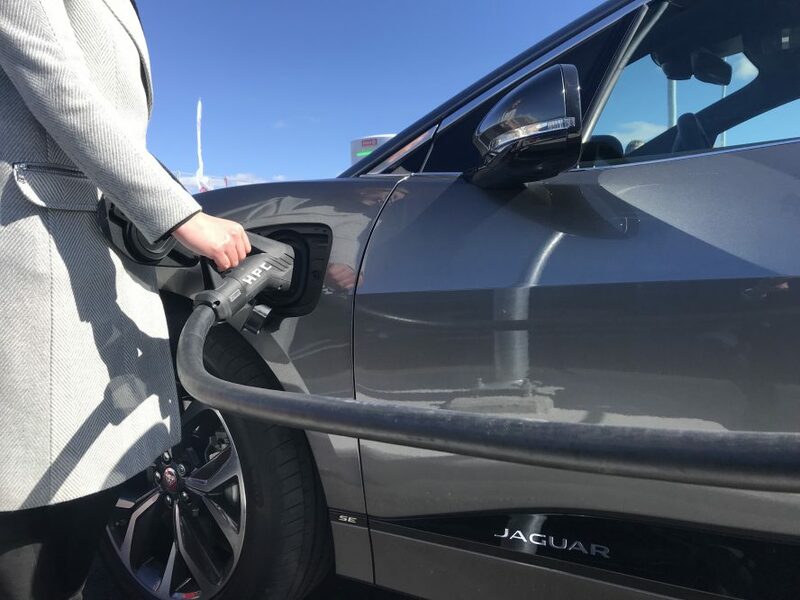 The Alpine country allocated sites for fast charging along highways through one central government agency and Ionity was one of several successful bidders for the tender. A glance at the map shows that indeed Ionity has made the most progress in the DACH region. However, here too, Ionity must manage various stakeholders, and Groll says that the German state of “Baden Württemberg, for example, is fairly well covered”, while states such as Lower Saxony are basically in lockdown. Still, the pan-European positioning represents one of the most competitive advantages for Groll, and the EU awarded the network for it. The JV of Audi, Porsche, Daimler, BMW, and Ford received 39 million euros through the Ten-T programme and a location near Brussels will be opened in April. Sweden, Denmark and (still) the UK are also at the receiving end. In Norway, however, the new High Power Charging Corridor has managed without subsidies, and the Secretary for Transport and Communications present at the opening considers this a win-win business case for all concerned. For the still generous tax incentives for electric cars in Norway, he announced a slowdown, but not too soon. Back in Oslo, there is time to come to some conclusions. We admit we did fly in from the UK to open a high power charging station for electric vehicles in Norway. But as soon as the trolley rolled on the parquet of Oslo Lufthavn into the main hall that carries a wooden beam structure and a smell of Ikea, the carbon Karma payback set in. At least the feel of it, after all, Norway is a country that applies where others only talk about the transport turnaround. Taking the dedicated train into Central Oslo, a quick survey confirms our reports – close to every third car here is electric. Seeing troops of i3s at a crossing, trailed by a sensible Leaf and a Zoe or two, plus the ever-present Tesla feels like the new normal in no time. Moreover, Oslo discourages citizens from owning a car of any kind in the first place. 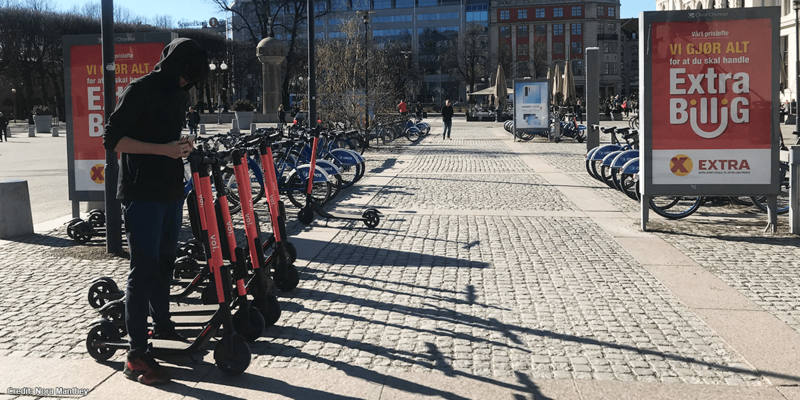 On-street parking is rare and expensive, and there are many one-way roads so that Oslo is a walking city – a fact we experienced first-hand. Besides, there is plenty of micro-mobility, and a pivotal scene unrolled when an electric skateboarder rushes uphill, with a Segway and a kick scooter in close pursuit. The little light electric vehicles are the latest addition to the town and spread wide. Made by Voi from Sweden, the LEVs appear in constant use and booking is easy. Two levers, one for speed and one for braking, is all there is to feel soon pretty fast and pretty Norwegian and it’s a pretty good feeling.